August | 2007 | Two cultures, one mind. I’m updating my home pages with all the recent changes. I fell out with Google pages as I thought I had lost my page of publications (the hardest to recreate), but having logged in on another machine, it’s all there fine – phew! And The Register has just posted this really interesting article about early blogging. I was going to do a ‘compare and contrast’ about what I was doing in 1997 and the time of Diana’s death, but I remember the day clearly and I’m slightly ashamed about what I was doing on the day! Marking workload – not the post you’re expecting! Way back in June I was bemoaning the amount of marking that had to be completed. Now, as we’re in the middle of the exam resit period, I have another moan. Bear with me on this. The reason that there’s so little marking is that so few people have resubmitted coursework or sat resit examinations. I’m estimating that I’ve got about half of the work that I would have expected, given pass rates last year. It could be that students have simply missed the fact that the assignment deadline was today, we usually talk about the ‘September resits’, and the resit period has moved slightly earlier, being the last day of August may have confused some people. But those that leave it to the very last minute are unlikely to be particularly successful anyhow. Exam attendance is harder to work out – for two exams which I was invigilating I’ve had no students turn up. For one of these which was a postgraduate course, this means they have just one, final chance to pass the exam before being thrown off the course! With much uncertainty in the department leading up to, and over the summer break, it’s possible that some of this has been passed onto the students even if not explicitly stated to them. Let’s hope that those which have submitted something have made it worthwhile. As they would have said on the Fast Show – “Today I have been mostly working on the student handbook.” This would have been a relatively easy task had I only got the handbook from preceding years in Adobe .pdf format. As anyone who has tried this will tell you, the cut/paste ability is not strong from this, portable document format was developed as a publishing tool, indeed one of the advantages over posting a word document is that it’s difficult to change. So I have been formatting, cutting, pasting, aligning most of today. I’ll be going into an exam invigilation soon, and apart from the sighs of the students, there will be a steady click click from my Mighty Mouse (thanks again guys – a brilliant birthday present), as I format the handbook. This is an important document, as it contains the rules and regulations that the student must adhere to. It’s introduced by the personal tutors during induction. It’s tricky getting the balance between being verbose, but including all the important information. I need to get this done by the end of the week, and then make sure that the rest of induction is sorted, it’s looking OK, and I’ve done the important things (like ordering lunch for all students, the delights of having a small course with funding! ), but I want to make sure that the students get ‘enough, but not too much’ of the induction experience. One thing that is fun is freshers fair, and I’m planning to take my camera to take some pictures, it’s hard to believe how chaotic it can be, but it’s good fun too, and I always try to get there. When the going gets tough, the tough get mapping. Or mind mapping, which have made a bit of a reappearance in my life, after a delay. Mind mapping is like a habit which you have to get into. With some birthday money (well, an Amazon gift voucher, which is as good as cash for me), I’ve purchased the classic Tony Buzan book Use Your Head – which uses mind maps as a revision aid as well as a technique for making connections. My Open University students must create a mind map as part of their final assignment, and I’ve been able to point them towards using FreeMind, a mind mapping software which is cross-platform, and very very good, I just wish it would move from version 0.8 to a full version. Then Simon pointed me to this post about mind mapping. I have yet to evaluate the other packages mentioned, but at first glance they appear a little complex, and over the top for my needs (I still sometimes use paper and felt tip pens for my maps). If I get chance to give these a proper review, I’ll post here. Finally today, I’ve created two mind maps – one for my IPR (appraisal) with my manager next week, the other the mapping of a brand new module which I have to deliver next semester. I’ve attached this second map below as a link (it’s saved as a PDF) , created using FreeMind on my MacBook. The key is getting the balance right, and knowing when a mind map is useful or productive. I find it great when I can’t get a handle on something or a task appears to be too large. Breaking it down without the rigid structure of an outline within a document helps me make connections, and similarities. I think I fell out of favour with the idea after my dissertation, I spent days creating beautiful mind maps which captured on one page the primary research which I had carried out for the MA dissertation, which were then all but ignored by the supervisor and marker. This was frustrating for me, but I’m (hopefully) putting this behind me now. Through WebWorker Daily, I found the site called Lifehack. It has a lot of useful information to make life easier. I see it as a ‘dip in’ rather than one that I have subscribed to the feed, but this article caught my eye, as it summarises a lot of what I try to tell students, but written in an appropriate language. I’ve summarised the bullet points below, but please do try to get over to the full article as there’s a lot more information, and it’s written in an informal style. I’ll be using this in my teaching next semester where appropriate. Start, don’t end, with Wikipedia. Have a research question in mind. Deal with one piece at a time. There’s only one that I would add to the list, and that’s reference, reference, reference! This is so important, but students still see it as an ‘add on’, something that’s nice to do if you get time. Even at postgraduate level I still award up to 15% of my marks for correct referencing. This has been criticised by some external examiners, but it does ensure that the referencing (mostly) is completed to the appropriate standard. The dreaded student handbook is calling today, then it’s a week of off/on invigilations, followed by the inevitable marking. Ah well, it’s good to be back, and it’s only 108 days until my next holiday. A bank holiday today, and instead of lazing in bed, I’m frantically waving books and DVD cases in front of my MacBook. Simply, it’s the best non-office based application I’ve ever used, thanks to the tip off off from my friend Gareth. 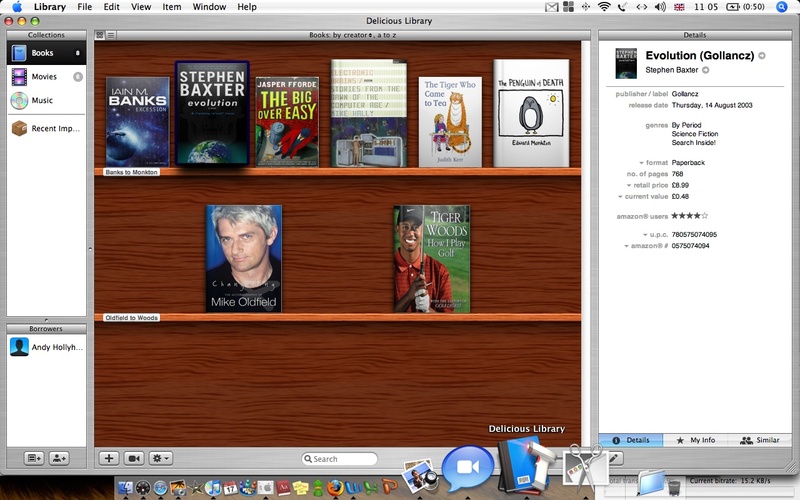 Delicious Library is a great application. Simply start up your iSight camera (built in to my new MacBook), and wave the barcode in front of the camera. It finds the barcode, searches Amazon, then downloads the details to your PC. I have in excess of 100 DVDs, and around 500 books. It’s going to be great to catalogue these. There’s also a ‘library’ service, where you can loan books out to people, email them, and (this is the Web 2.0 bit) search for recommendations from other people. This works really well – it connects the physical world (books) with the electronic world. And it works with a slick interface, well constructed and without any of that ‘clunkiness’ that one sometimes expects from this type of application (screenshot below, click to embiggen). The cost of the software for the full version is $40 US, and this seems to be great value, as soon as I’m sure my pay has gone in I’ll be buying the new version. And I can’t let the blog pass without a big thanks to Simon and Gareth for the gift of a wireless mighty mouse for my birthday, the perfect complement to my MacBook – I’m a very happy bunny this bank holiday weekend. It’s been a very satisfying day, though at the outset it wasn’t looking too hopeful. As usual, I checked my emails before I came into work, there was one from a new student who was starting in September and had received all the paperwork, but had been told by UCAS that we had rejected them. As I’m dealing with a faceless bureaucracy at the moment I maybe had more sympathy than usual for the student’s predicament. The outcome was a good, and swift one however, by the time I got into work the student had been called and reassured, and the student had emailed me back thanking me. Now if only insurance companies could be that efficient! Then a student called to say that they couldn’t find the resit coursework, which has been available since June, and is due in next Friday. A couple of calls and the problem was resolved with little hassle, and I was able to text the student back and email the coursework off. But the proudest things today was to confirm (mostly) the teaching for next year for the ITMB. As some of the modules are delivered by other departments in the Business School I needed to confirm that the teaching was in place for these. All done now, even the final year module that’s never been delivered before. All I need to make this the perfect day, academically wise is for my postgraduate student to turn up for the meeting at 2:00pm. It’s not looking too good, but the student was travelling from Cardiff for the meeting, so there’s a possibility that his train is running late. A long bank holiday weekend, (and my birthday), then back into the swing of things next week – top of my ‘to do’ list – the student handbook! I’ve just received an email from a colleage, who reassures me that the task I’ve passed onto him is ‘on his to-do list’. The latest RSS feed I’ve subscribed to is “Web Worker Daily” (I’ll blogroll him as soon as I’ve remembered how). WWD switches from product reviews, and best practice for home workers. As I usually spend one week day, one weekend day and up to two/three evenings a week in my home study, I think I can classify myself as a homeworker at least part of the time. WWD has some interesting views on to-do lists, here, and here. How many of his not-to-do’s do we do (everyone follow that) in our daily life (reproduced below)? 8. Do not carry a cellphone or Crackberry 24/7, seven days a week—make evenings and/or Saturdays digital leash-free. Staying out of the classroom..
My holiday in France inspired me to learn the language more. I was all set to book courses at the Brasshouse language centre in the centre of Birmingham, but as I’m already studying three different things at the moment (creative writing course comes to an end soon, a new world archaeology course starts in September, and I’m also having golf lessons! ), I was concerned that I may be stretching myself maybe a little too much! But then I found the BBC Ma France website, which appears to be at the right level for me. I’m promising myself therefore that I’ll sign up to this and do it ‘properly’ before my next holiday in France. There’s a lot of material here – I reckon about 24 x 1 hour sessions, and all for free. I know what I really want is interaction with French speakers to gain confidence (and importantly listening skills), but I can always book one of the more intensive one-day workshops at the Brasshouse nearer to the time for this. First day back in the office, and it’s a steady start. I’m still wresting with the student handbook for induction, but the rest of it is pretty well in place… at the moment anyhow! My eighteen hours in the clearing office came to a close at 4:00pm (well, to be honest about 3:50pm, we’d had enough by then). I’ve been able to make some good offers to students who seemed genuinely pleased to be able to come and study at UCE. You can tell that some were interested, they asked questions about where they would live, what the course was like. However there’s also another group that simply seemed to be collecting offers. I hope that some of them come to us, as I think we could offer a lot to some of these. My favourites today though were those that came in person to look round, and we were able to give them their offer packs on the day. In particular two HND studenss came in, and it was great to be able to talk to them about the course, and what they could expect. They were particularly keen to find out about the assignment/examination split, and what they could expect. They didn’t know about the bursary scheme (we provide all students with cash lump sums at the end of each semester), so it was good to be able to joke about them using the money to buy Christmas presents. The situation doesn’t look too great for the ITMB course, but there’s still time, after this flurry of activity we’ve still got a month before induction, and a lot can happen then. I’m off on hols for the next three days, then back into the swing of things on Thursday.